(0 Customer Reviews) | Write Review 6 issues per year Canadian Hot Rods is a national, glossy full-colour, magazine published bi-monthly in hard copy & digital format with two additional digital only editions, for a total of eight (8) issues a year. We cover many areas of the automotive hobby, but our primary interest is in modified older vehicles (mostly pre-1985) and specifically street rods, resto mod and pro-touring muscle cars, customs and hot rods. Our content consists of photo/story features, car show coverage, how-to articles, opinion columns and much more. We don’t just write about other people’s cars — we build and drive our own cars and these projects, include a 1966 Satellite and 1957 Ford Ranch Wagon drag car — and upgrades to the projects are covered frequently in the magazine. While our focus is on mainly Canadian-based content we also often cover some of the top US car shows and from time to time feature cool American-built hot rods. 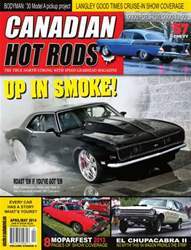 Canadian Hot Rods is a national, glossy full-colour, magazine published bi-monthly in hard copy & digital format with two additional digital only editions, for a total of eight (8) issues a year. We cover many areas of the automotive hobby, but our primary interest is in modified older vehicles (mostly pre-1985) and specifically street rods, resto mod and pro-touring muscle cars, customs and hot rods. Our content consists of photo/story features, car show coverage, how-to articles, opinion columns and much more. 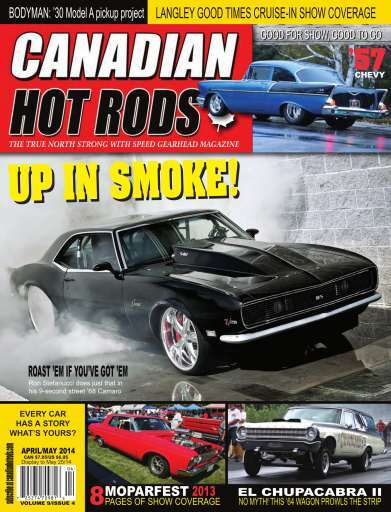 You'll receive 6 issues during a 1 year Canadian Hot Rods magazine subscription. You'll receive 6 issues during a 1 year Canadian Hot Rods magazine print subscription.